As older adults progress in age, their nutritional needs are likely to change. Each food your parent consumes may have a different effect on his or her body. Here are some of the reasons nutrition is important for your loved one. Blood circulation is controlled by the heart. When the heart doesn’t get the nutrients it needs, the risk of hypertension increases. High blood pressure stops cell growth, leads to poorly functioning organs, and hardens arteries and blood clots. As a result, seniors have a higher risk of heart disease. A healthy blood flow is crucial for brain function. The antioxidants from certain foods help the brain defend against toxins and increase mental sharpness. Eating nutritious foods is one of the healthiest lifestyle choices for the elderly. 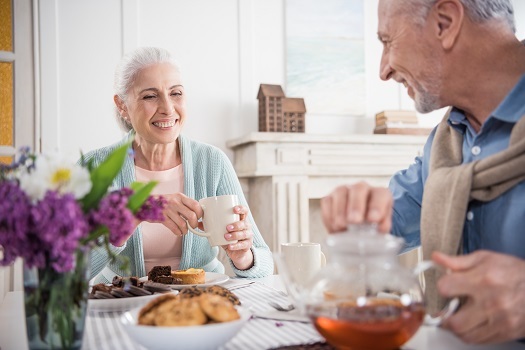 If your aging loved one needs help managing everyday tasks or encouragement to adopt healthier lifestyle choices, turn to Home Care Assistance, a leading provider of elder care. Montgomery Home Care Assistance provides professional in-home caregivers around the clock to help seniors live longer, happier, and healthier lives. There are a variety of foods that can contribute to strong joints and muscles, alleviate pain, and lower the risk of arthritis. Since protein makes up a large percentage of bone mass, it’s important that seniors follow a protein-rich diet as they age. Older adults should also eat foods that provide calcium to influence growth hormones in their bodies. Fruits and vegetables contain the best nutrition for older adults, keeping their bones healthy and preventing balance issues, slips, falls, broken bones, and head traumas. Many seniors need help preparing nutritious meals. If your aging loved one needs occasional help with bathing, grooming, cooking, or other basic household tasks, or if you need time to attend to important personal matters, reach out to Home Care Assistance, a leading provider of live-in and respite care. Montgomery seniors can maintain their independence while living at home with the help of our reliable respite caregivers. Your loved one’s diet and other lifestyle choices could prevent him or her from getting a good night’s rest and experiencing insomnia. Seniors need to get eight hours of sleep each night so the body can remove dangerous toxins and boost the immune system. Proper nutrition can help older adults go to sleep and limit the amount of times they get up during the night. The foods seniors eat can have a negative or positive impact on the way their brains function. Some foods disrupt the way the brain stores and processes information, leading to memory issues and poor communication. However, eating nutritious meals can clear dangerous chemicals out of the brain, reducing the risk of dementia and Alzheimer’s. Older adults tend to have less resilience to stress in their senior years, making it difficult for them to manage negative hormones and feelings. Failing to handle stress can increase a senior’s risk for strokes, diabetes, memory loss, depression, and other physical and mental issues. Good nutrition can relieve stress and boost cognitive abilities. The vitamins and minerals your loved one consumes can neutralize stress modules and boost his or her quality of life. Eating nutritious meals is not the only way older adults can boost their wellbeing. Seniors who want to remain healthy as they age can benefit in a variety of ways when they receive professional Dementia care. Montgomery, Alabama, Home Care Assistance is here to help your loved one accomplish daily tasks, prevent illness, and focus on living a healthier and more fulfilling life. To create a comprehensive in-home care plan for your aging parent, give us a call at (334) 593-3988 today.